Caracal Models CD72059 - F9F8-T / TF-9J "Twogar"
A twin-seat development of the US Navy's F9F Cougar, the F9F8-T / TF-9J "Twogar" served the US Navy for many years as a carrier-capable jet trainer. With the recent release of the Sword kit, we finally have a modern kit of this important type in 1/72 scale. 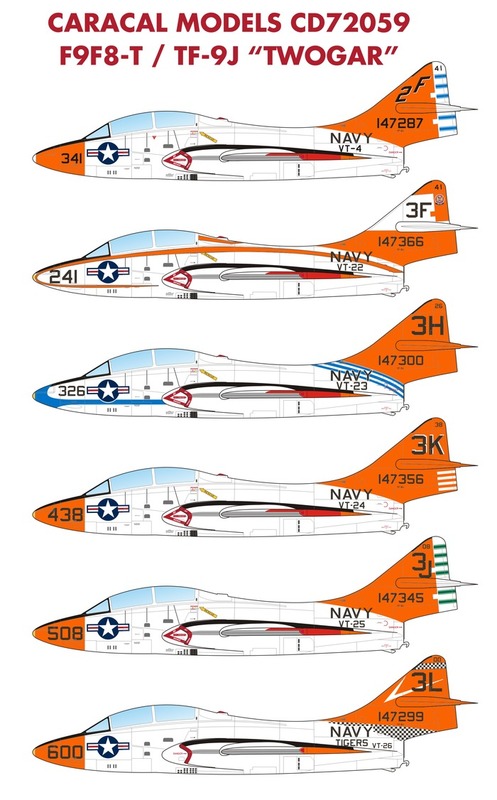 Our latest sheet provides markings for 6 different US Navy training squadrons. Accurate stencilling and national insignia to build any one of the options is included. This sheet was professionally screen printed by Cartograf in Italy. We will start shipping this decal sheet on June 18, 2018. 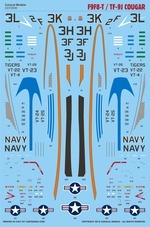 You can preorder this decal sheet securely with your credit card or PayPal account now.